- Anyone else an old fan of Ace of Base? They have a new CD coming out this year. Check out this link for the latest video. I miss 90's techno! - 380 million eggs removed from stores due to salmonella fears. Check out the store here. I miss the days when my family raised chickens for the purpose of eggs. It also doubles as a wrist cuff, although from my experience chicks poop the minute you touch them so the cuff will likely need washed before you share it. - Speaking of Etsy, I discovered Regretsy this week, check it out here. There is some weird home made stuff on that site!!! - On a more personal note, I'm back to working IN the office this week and discovered I miss everyone jokes. I may have laughed a little too hard and loud; something about being home with small children that makes co-workers funnier after two months of absence. Have a great Random Tuesday ya'll! It wasn't that long ago that I downloaded Ace of Base...but I had no idea they were still together, let alone coming out with a new CD. 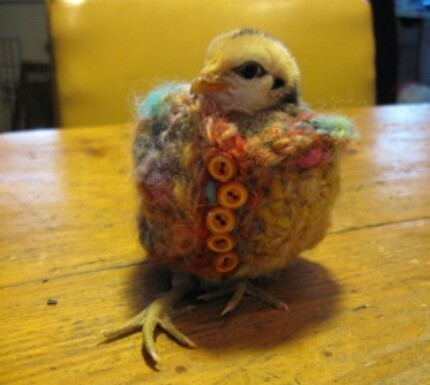 And the chicken cozy...really?! Even after visiting the page I think it's too funny. I forgot...good luck with being back at the office...wow. I go to karaoke all the time and I swear I'm going to sing "I saw the sign" one of these days. Hmmm, a chick cozy. Interesting. I can't believe Ace of Base is still around. I am going to have to check that out. We had some eggs that were recalled several weeks ago. I have just given up on them for now. HUGE Ace of Base fan!....I saw the sign, and it opened up my eyes, I saw the sign. My kids think I'm a little neurotic when they come on the radio and I crank it up and start singing along at the top of my lungs. I always laugh very loud with my friends. :) And I just heard that "signs" song last week. Brought back some memories. Have a great one, Rach! Wow - Ace of Base still together? I have one of their album on tape! And, after watching the video you link to, I totally aspire to that girls' hair. "chuckle" I had no idea Ace of Base was such a hit with the blogger community! Sounds like a good Christmas present for all!! !